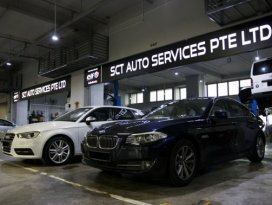 SCT Auto Services is a one-stop repair centre with expertise in vehicle servicing, repairs, and spray painting. Through the 40 years that they have been in operation, they have built up a team of skilled and experienced technician equipped with specialised equipment to provide top-notch service for all their customers. SCT Auto Services is made up of several divisions, providing a wide range of services with includes car grooming, towing services and car rental as well. Reasonable market price & Good service but just need to wait a little longer. Still will do my servicing with you of your good service & Reputation. Friendly, knowledgeable and courteous staffs. Well kept premises. Price wasn't the cheapest but you pay what you get . Came here to svc my car and get a new ACDelco batt. My car was performing better after servicing and during servicing, the mechanics and staff all very courteous and professional. Will definitely come back. Is my regular place to rent on every occasion..from wedding, biz or pleasure use. Friendly staff and list of interesting car they have for you and price are reasonable.